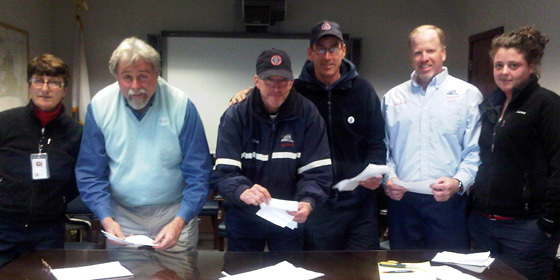 employees overwhelmingly ratified their new contracts 23 – 0 / 73 – 1 respectively. Agency/Terminal Negotiating Committee Members & Observers counting ballots in Woods Hole, MA. 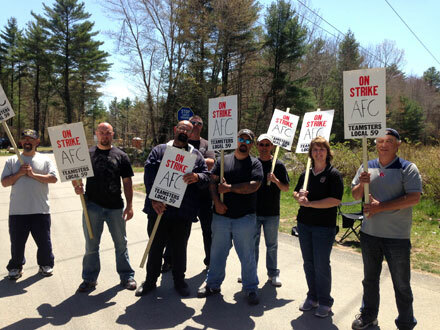 On behalf of Teamsters Local 59 and our members at AFC Cable Systems, I would like to extend my sincere appreciation to all that supported us during the recent 13 week strike. I am pleased to report that on Sunday, July 14, 2013, an agreement was voted on and approved by our members at AFC and on Monday, July 15th, they began the process of returning to work. Only by the resolve of our striking members on the picket lines and the support shown by others were we able together bring this ordeal to a satisfactory conclusion. Please note the following results of the Nomination of Officers at a meeting held on Sunday, October 9, 2016 for Teamsters Local 59. The term of Office is January 1, 2017 through December 31, 2019. Vice President: Manuel S. Amaral Jr.
Recording Secretary: Robert Sylvia Jr.
As the above mentioned candidates had no opposition, the above mentioned candidates were declared elected by acclamation. 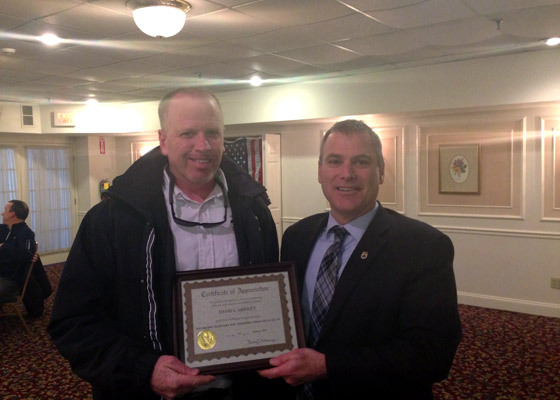 Nominations for the offices of Secretary-Treasurer and Executive Officer/Business Agent, President and Business Agent, Vice President, Recording Secretary and three (3) Trustees will take place on Sunday, October 9, 2016, at 10:00 A.M. at the Knuckleheads Meeting Room, 85 MacArthur Drive, New Bedford, Massachusetts. The terms of office will commence January 1, 2017, and be for not less than three (3) years. The two (2) full-time positions will be Secretary-Treasurer and Executive Officer/Business Agent and President/Business Agent. All remaining five (5) positions will be part-time. Nominations must be moved from the floor of the meeting by a member in good standing other than the nominee, seconded by a member in good standing other than the nominee, and accepted by the nominee at the time, made either in person or, if absent, in writing. For a member to be eligible to nominate or otherwise participate in the nominations meeting, his/her dues must be paid up through the month of September, 2016, by Saturday, October 8, 2016 - 12 noon. Prospective candidates, nominators and seconders are advised to verify, in advance of the nominations meeting, their eligibility status. To be eligible for election of any office in a Local Union, a member must be in continuous good standing in the Local Union in which he/she is a member and in which he/she is seeking office, for a period of twenty-four (24) consecutive months prior to the month of nomination for said office and must be eligible to hold the office if elected. "Continuous good standing" means compliance with the provisions of Article X, Section 5 concerning the payment of dues for a period of twenty-four (24) consecutive months together with no interruptions in active membership in the Local Union for which office is sought because of suspensions, expulsions, withdrawals, transfers or failure to pay fines or assessments. Provided, however, that if a member on withdrawal deposits his/her card in the month immediately following the month for which it was effective and pays his/her dues for both months in a timely manner as provided in Article X, Section 5 (c), such period of withdrawal shall not be considered a break in continuous good standing in the Local Union. 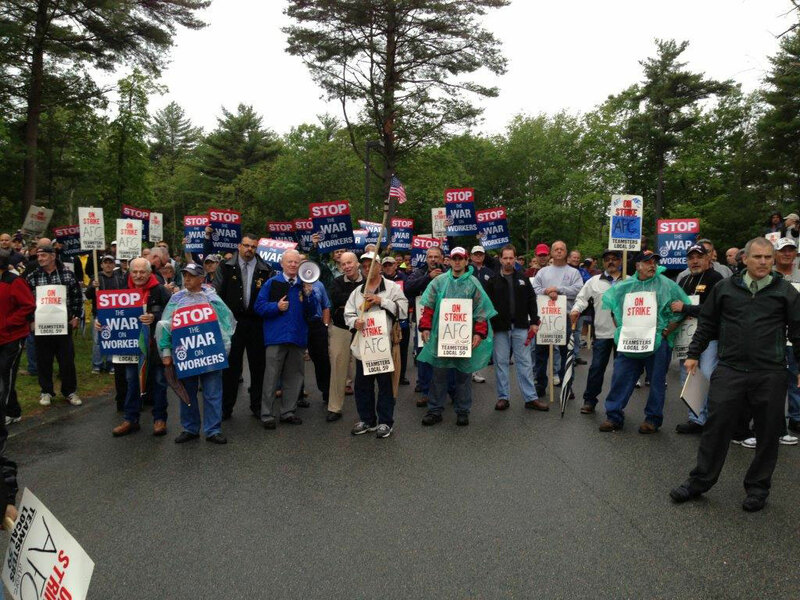 In accordance with the Local Affiliated with Teamsters Joint Council No. 10 Union By-Laws, Section 16, C.2, "No member shall lose his good standing status for any month in which his dues have been withheld by his employer for payment to the Local Union pursuant to his voluntary authorization provided for a collective bargaining agreement, by reason of delay or default in the payment of such dues by the employer to the Local Union." Under Article X, Section 5 (c), dues 'are payable on the first day of the month and must be paid on or before the last business day of the current month. The election of officers, if such be necessary, will be conducted by mail ballot. Slate voting will be permitted. To be eligible to vote, a member must have his/her dues paid up through the month of October, 2016, by Wednesday, November 23, 2016 - 12 noon. Ballots will be mailed to the most current address contained in the Local Union's records as promptly as possible following the nominations meeting. Members who have not received a ballot by November 12, 2016 should contact the Local Union Office. The voting will be held from November 5, 2016, through November 23, 2016, midnight. The Ballots will be picked up at the Post Office at 9:00 A.M. on Saturday, November 26, 2016, and counting will commence at 10:00 A.M. Members not on check-off or who are on lay-off are advised to pay their dues through the month of October, 2016, in advance of the date of the cut off (November 23, 2016) to insure that they are eligible to vote. Instructions for the completion of your ballot will be enclosed in the ballot package. This is a secret ballot vote. You should mark your ballot in private and mail your ballot, sealed in the secret ballot envelope to the designated post office box in the postage paid envelope provided. Do not give your ballot to anyone. Elected officers of the Local Union shall, by virtue of such election, be delegates to any Joint Council with which the Local is affiliated as well as to any convention of any subordinate body, that may take place during their term of office. Elected Local Union officers shall be delegates to such conventions in the order of priority set forth in the Local Union By-Laws. If the By-Laws do not set forth an order of priority, the principal executive officer shall have first priority, followed by the remaining elected officers in the order determined by the Executive Board. The complete Union rules governing the nomination and Election of Officers are set forth in the International Constitution, the Local Union Executive Board, and the Local Union By-Laws and are available upon request from the Local Union Office. The proposed Local Union Plan to nominate and elect delegates to the 2016 IBT Convention to be held in Las Vegas, Nevada in June, 2016, was submitted to the Election Supervisor on August 10, 2015. The Election Plan is available for inspection at the Local Union Office at 27 So. Sixth Street, New Bedford, Massachusetts, by any member of the Local Union, any candidate for International office, and by the International Union or any subordinate body. Upon request, each of the foregoing has the right to obtain a copy of the Plan at no cost. Inspection may be made during the usual hours of the Local Union Office, which are Monday, Tuesday, Thursday and Friday 8:30 a.m. to 4:00 p.m. and Wednesday, 8:30 a.m. to 12:00 noon. Saturday the office is open from 9:00 a.m. to 12:00 noon.